El Carrito is located a block away from Chicano Park and is on Logan Avenue. Like Chicano Park the restaurant is located off of interstate 5 and is subject to the same conditions, like noise and air pollution. 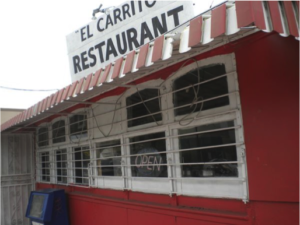 El Carrito was not just a restaurant, but it served many purposes for the community. Queso describes it as being used as a shoe shine stand. The back of the car was used as the shoe shine stand and Queso was able to make some money in order to be seen at the Neighborhood House Clinic. As you can see every aspect of the community was related. At one point El Carrito was also a space for local politicians. A place for community concerns to be heard and expressed. Queso really emphasizes the visibility it had and how important it was for the residents of Barrio Logan. Logan Heights had its own Chamber of Com erce, but local businesses of Barrio Logan were determined and made their own. 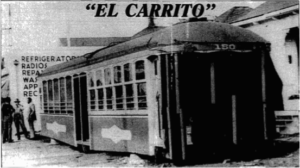 El Carrito was a central place for the Barrio Logan Chamber of Commerce to meet and unite together to better their businesses and make them places that the residents would be happy to shop or eat at. Queso describes a time when they closed the streets around El Carrito and had a street party with live music to enjoy the ambiance. Below you can see what El Carrito looks like today. It is very different and no longer has the original seating inside and looks more like a building than an actual cable car from the 1930s. Queso describes his desires to restore it to its former glory. He has estimated that it would take 100,000 dollars or a little bit under that to make it what it was. Queso has this vision, because he remembers it when Al Johnston first bought it. The inside is small and only has a few small booths. 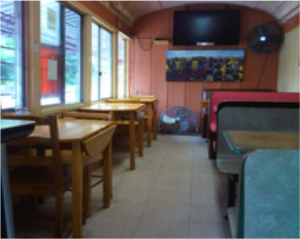 Many customers like the home feel that they get when they decide to eat here. The kitchen is in sight and is small, but you can see your food being made in front of you. Although it brings this great feeling, it does not look like it used to and some clients are weary of entering because of its old style. If the funding were to come through, El Carrito would seriously benefit from it. 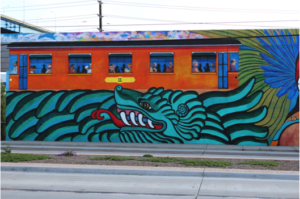 Queso is a muralist that has done a mural close to Chicano Park toward the industrial harbor. Most of the painting is an oath to the cannery industry, but a section shown below is of El Carrito. 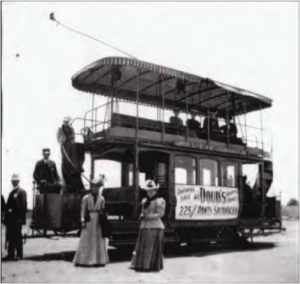 It is painted as if it was still in use as a cable car with the driver painted as Al Johnston himself. They called him “Pelon”, because of his bald head. 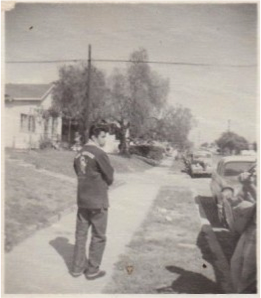 Al Johnston was a really important figure in Barrio Logan because he was a spokesman for their issues and supported the community in many ways. Queso refers to Al Johnston as a mulatto, because he was half black, which meant he could also identify with the black community. He was a musician that brought life to any setting. Besides owning El Carrito, he supported many community organizations. For example, he sponsored many local teams. 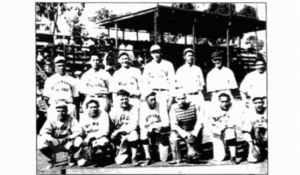 Many of the local teams were sponsored by local businesses, like liquor stores and markets, which is very unusual today. He was also very instrumental to the founding and survival of social clubs. 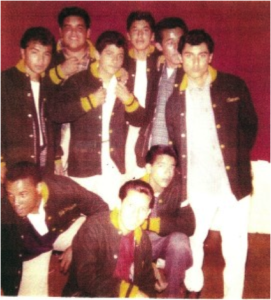 He was the personal advisor and mentor to Los Gallos pictured to the right. 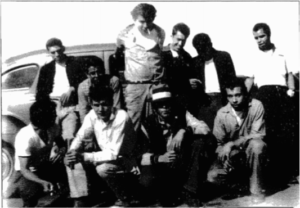 He was also important to the founding of Los Chicanos, which held meetings in his garage. He was also very intricate to the takeover of the Neighborhood House. He was a positive person that really looked out for the community.